Hey all, just a quick post on the Federer/Wawrinka match and a quick look at the final tonight between Djokovic and Fed. The best news is that by making the final Roger has ensured he heads into the US Open still ranked the number 1 player in the world. That doesn't make a whole lot of difference for the draw but I'm sure it's a great confidence boost to be in the draw as the number 1 seed. Anyway back to last nights match against Stan, compared to the Fish quarter final match this one never really got going. There were some nice points but nothing really exciting happened, there weren't many rallies and Roger wasn't playing at his best. The first set to me seemed to last forever. After Wawrinka won the toss and elected to receive (a strange play) I actually thought Fed was just going to steamroll him but he probably should have won the first set. He played the better of the two, was serving better and looked like he wasn't really under any pressure. Unlike against Fish, Roger's serve wasn't firing and he served 4 double faults in the first set, that's a crazy number at this level. As usual though Roger just hung in there, kept calm and despite wasting a ton of set points at 5-4 took the tie break 7-4. Winning the breaker was definitely a boost for Roger as he did waste a ton of chances at 5-4. I think he had 7 break points in the set and when Roger hit a backhand chip up the line to get advantage again at 5-4 I figured he would just take the set but on the next point Stan stopped a rally and challenged. Luckily he was right, looking back it was a brave challenge that paid off but at the time I thought that was near suicide. Luckily for Fed, he didn't let any missed chances play on his mind and he got a mini break early in the breaker and pulled away to take the first set. If you were Wawrinka at this point I think you'd be pretty annoyed as considering how well he played for three quarters of the set he really should have probably won it or at the very least put up more of a fight in the breaker. If you thought the first set wasn't the greatest then the second was arguably worse. Roger did manage to up his level just a notch and serve better but Stan's resistance came to an end. 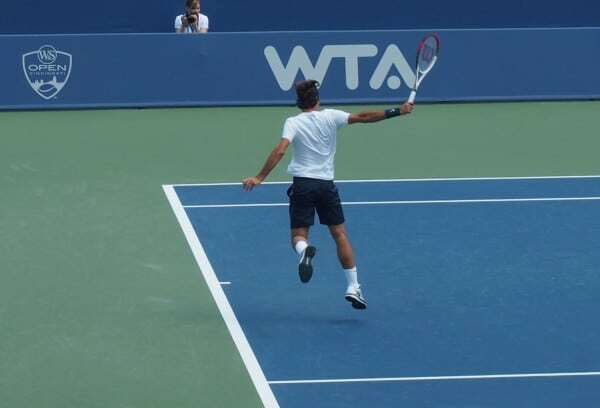 He was still going for his shots but the errors crept in and Roger was able pretty much cruise though. He broke at 3-3 after he saved BP on his own serve in the previous game and then broke again to take it 6-3. Game, set, match 7-6(4) 6-3. From Stans perspective I think he will be disappointed to almost give up the match after he played a good first set. The fans noticed this too I think as the atmosphere felt a little flat and nothing compared to the Fish match, this probably effected Roger too as he didn't really look that into the match, he was still playing well but there was nothing really to get him going or fired up and you almost felt like the match just needed putting to bed which he did comfortably enough in the end. So overall I'd say a good match to win because it meant he kept number 1, but a poor match from the fans perspective. Love these interviews in the studio/outdoor terrace after a match, great for the fans in the grounds and great for the fans across the world to see this kinda stuff. I give Djokovic the edge in this one purely because he's been the most dominant outdoor hard court player for the last couple of years. He's coming off the back of a good win in Toronto after some tough losses at Wimbledon and the Olympics so I think he will be up for winning this one ahead of the US Open. Having said that Djokovic has never won in Cincinnati before and is actually a 3 time losing finalist. As we all know Roger has won 4 titles (beating Djoker in 2009) so he always manages to play well here and that could be the difference. Whatever happens I think this one will probably be a close one, if Roger wins then I think he might blitz the first set and then either win the second on a breaker, or it will end up going to 3. For Fed to win I think he has to win the first set and then he has a platform to build on. To be honest I'm not going to be too disappointed either way by the result, this tournament is a tune up for the US Open and Fed has secured number one by the end of the tournament will have got 5 solid hard court matches under his belt which is ideal preparation. Prediction, if Roger wins the first set he'll win the match 6-2, 7-6 (5). If Djoker gets out the blocks fast I think he will take it 6-4 7-5. Either way it should be a fun match and that's all I want. I don’t think this match was ever going to be fantastic as these two are friends. Not only that but they’ve just spent a lot of time together after teaming up for doubles at the Olympics so I’m sure this gave the match an odd dynamic. I think Roger was just hoping to get through it and he did without too many hiccups. I think the Fish match showed him and the world that his game is right there. Whether he brings it for the final is not all that important. He knows he has it for when it really matters at the U.S. Open. Today will be interesting but won’t be all that advantageous physiologically to the winner I wouldn’t think. Results between these two can swing wildly from meeting to meeting and both are too experienced to let a Masters 1000 final loss get to them. That said I hope Roger wins today for a record equalling 21st Masters title AND a record breaking 5th Cincinnati title. Yeah perhaps that effects it. Usually though Fed turns up the heat on stan and plays in JesusFed mode so it’s a joy to watch even though it’s one sided but last night it boring. Good point, results between Djoker/Fed do swing wildly, I think that’s because they both know they can beat one another on any given. Matchup with Nadull is a little different. I’m hoping for a win too so we shall see! Ah coming from a set down? Interesting, tough over 3 but Fed has done it many times. I think he has to win the 1st though. I won’t be too disappointed if Roger doesn’t win today for the same reasons you give. It’ll be nice to watch without all the tension and pressure and HOPE it turns out to be an exciting one in spite of that. Also, I like the post match interviews too. Love Roger’s t-shirt in this one with the RF logo etc., he looks so relaxed! Yeah those outdoor interviews are cool, far better than pressers or on court as Fed has had time to reflect a little and the presenters/pundits usually ask half decent questions. Gilbert can be annoying but pretty knowledgeable. i agree with your thoughts on “predictions vs djokovic”. From my side as well , i am not going to be disappointed too (to be honest),,what i wanted is a good contest between the two…..
and as we always say ALLEZ FEDERER !!! Yep, hope we see a good match and Fed is on the winning side of the net! Whatever happens Fed is still number one. If Djokovic loses, it will hurt his confidence going into the U.S. Open and that might benefit Roger. I am hoping for a win for RF. Let’s see how this plays out. I’m hoping for a real dukefest. GO FED! Yeah Number 1 is a big thing I think going into the US Open. Definitely a boost to be number 1 seed. I hope Fed can win but gonna be close, Djoker best player on hard courts for last 2 years almost. You’re right. Every match between them has been won by the player who took the first set, every single match. Doubt that will change. Almost, there’s 5 or 6 matches where Djoker lost the first set then went onto win, US Open ’10 ’11, Indian Wells 08 Miami 09. Fed has never won though from a set down. Miami ’09, not Indian Wells ’08, sorry to be picky, I guess it’s just my personality. Also, Rome ’09… although I can’t think of any others. Yeah dunno why I said IW. Racket smash day. 5 times it happened. Someone wrote up the wrong stats then wherever I read it. You’re right. How could I forget that Roger was up 2-0 at USO 2011. It’s a good match to forget though! BOOM! So much fun seeing Fed winning. Wow, what a tournament. Didn’t lose a set, and didn’t drop serve the whole week! Crazy really, not often that happens. If ever. He said in an interview it maybe happened in Qatar but I have no idea on that stat. He hasn’t been broken all week. That’s pretty epic.